Our range of products include leather office bag, leather executive bag, leather laptop bags, leather briefcases, leather business bags and leather portfolio bag. The slim leather laptop computer backpack brings you the style of real leather, available in black, burgandy & brown, in a truly functional and sophisticated backpack. Your laptop computer fits in a padded, velcro-strapped section at the rear that measures 12 by 11 1/2 inches, while the size of the entire backpack is 12 by 14 1/2 by 6 inches. an organizer is zipped into the front panel, and there is another pocket on the side. Use the top handle or the adjusting padded shoulder straps to carry the backpack. 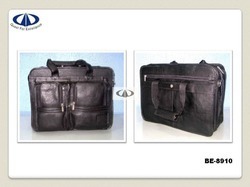 From the years of commencement, we are engaged in offering a huge assortment of quality approved Leather Briefcases. This range of Leather Briefcases is known for its excellent performance and is developed using advance technology. For further quality assurance, our team of quality controllers checks our entire product range on different parameters in compliance with international and national quality standards. Packaging Details: Each pieces are packed in plain Shining poly then into Master box. Each box with white label on it indicating Item No & color for reference. Master packing in corrugated box with packing list attested. Proper precaution are taken care such us inside full polythene & silica gel are put in all the packages to make Leather bags free from absorption of moisture and fungus. In order to have less transit time we shipped our consignment from reputed direct linear such us MSC,Mearsk & Transworld.